PLEASE!!! Do not mark Valeen's email as SPAM! 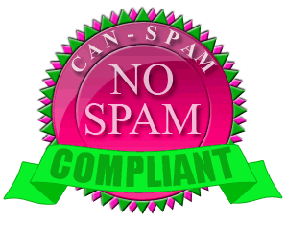 email marketing practices, and as a result has established this no-tolerance Anti-Spam Policy. Mirror Tarot values your privacy and trust in us and it's this reason we created this page. here. Takes 30 seconds or less to unsubscribe! moment and read our policy...thank you. also deemed to be Spam. email to our members and visitors, this includes the forum and any other purposes. Spam, as well as what measures are necessary in response to such Spam activities. also our Rules and Regulations. sending unwanted email to such persons. Additionally, each person on our subscriber list has the option of unsubscribing through a web-based method provided on MT's web site. Allow see # 7 of this section. Please allow 48 hours for this action to process. refund of fees that have been paid. the loss of MT's services, fines and possible legal action. MT has the right to actively review all subscriber lists, email's for suspiciously large broadcasts. consent and any Spam will not be tolerated. This page is to protect our visitors, customer and MT. possible and values it's reputation as a spam-free website. get it removed. Therefore ruining her good name and the site reputation. So please take 30 seconds or less to unsubscribe. Thank you! Remember to opt-out first! !